One of the closest areas to visit from Reykjavik is Þingvellir (Thingvellir) National Park. The Park is of historical significance to Icelanders. This is where the oldest open air parliament in the world (the Althing) was established in 930 and continued to meet till 1798. Thingvellir is also of paramount geological interest. 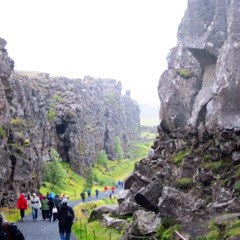 The North American and the Eurasian tectonic plates run through the Park and have created a rift which continues to expand. Thingvallatn is the largest natural lake in Iceland and lies south of the Park. It is the habitat of 150 types of plants and 50 invertebrates.